That’s right, the Houston Texans are in the playoffs for the first time EVER – AND they won their first game!!! It was awesome, I must say. As a die-hard football fan, I have been hearing people say “This is the year the Texans will make the playoffs” for a while now, but sadly, it has never actually happened. Until now. The crowd was ELECTRIC – I could feel the energy and hear the shouting from my house in Little Rock. Way to represent, people! I have no doubt that the home field advantage played a big role in Saturday’s win against the Bengals. Sadly, there was another playoff game on Saturday. This one between Chad’s beloved Detroit Lions and the New Orleans Saints. It started off relatively evenly matched in the first half, but when Drew Brees came out of the locker room for the second half, he had his big boy pants on and put a hurtin’ on the Lions. I like the Lions and the Saints, but for the sake of my hubby, I was cheering for the Lions. No amount of cheering can defeat Drew Brees. It was a sad night for the Weatherman, indeed. But the silver lining in all of this? Now the Weatherman can join me in cheering on the Texans next weekend against the Ravens! The Ravens have a stout defense and a pretty good offense too, so this will be a very tough game. Good luck, Texans!! On another note – DANG, did you see that overtime win by the Tebows – I mean, the Broncos?? AWESOME! Love him or hate him, Tim Tebow keeps on winning. And THAT is what he gets paid millions to do. It’s no surprise that I love college football. The BCS bowl games have been on our TV today, and we were most excited about the offensive shoot out that would be (and currently is) the Fiesta Bowl match up between Stanford and Oklahoma State. 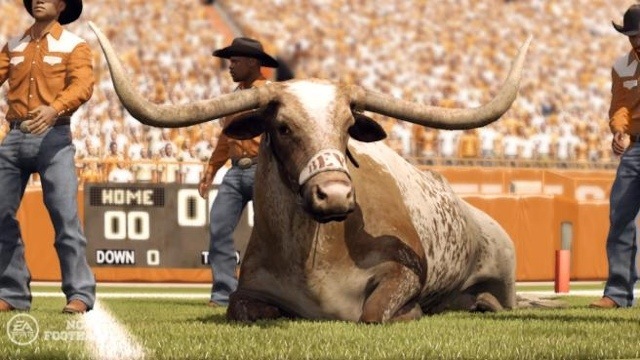 Of course, Bevo is my undisputed favorite college mascot of all time. Hands down. Period. But I must admit, there is a certain level of bias there. Irrelevant. 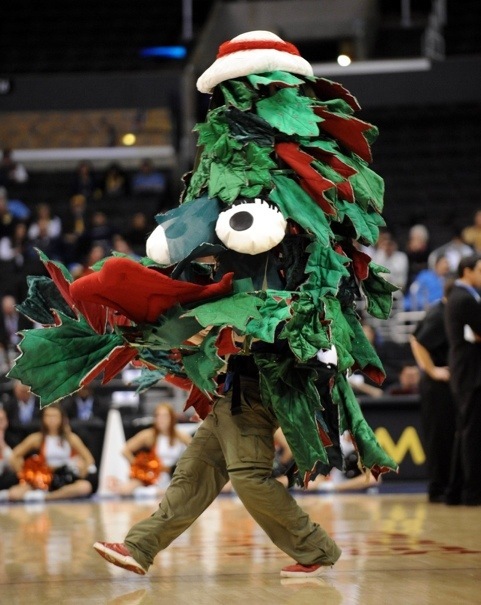 However, my favorite non-UT mascot is the Stanford dancing tree. That tree is AWESOME. He is just SO HAPPY! I can get behind that. I cannot stand the crazy cowboys from Texas Tech or Oklahoma State (they scare me), the stupid Trojan man from USC (arrogant jerk) or the Sooner Schooner wagon, drivers, gun boys or pony thing (for obvious reasons). Probably not coincidentally, Texas played against all of these teams while I was in school. So tell me–any favorite or hated NCAA mascots?? Last night, the BCS and other Bowl games for 2011-2012 were announced. I was sad to hear that the National Championship game would be LSU vs. Alabama. We’ve already seen that game and it was like watching paint dry. I would have much rather seen LSU play Oklahoma State in the big game. As Mike Gundy put it after the Oklahoma State-Oklahoma game, “It depends on if you’d rather watch a 9-6 game or a 39-36 game.” As for me, I’ll take the high scoring game every time. I was also sad to see that Texas got the Holiday Bowl. Now, I’m not saying that we deserved to be in a “legit” bowl this year – I’m just saying it’s sad that we’ve slipped this far from glory. Thankfully, I went to UT when we dominated, and that is the team that will forever live in my heart. Finally, OU got a dumb bowl too. The Insight Bowl? Lame. Oklahoma has clearly already given up on their season (did you watch the Bedlam game?? ), so this should be no fun to watch either. Sad face. Y’all – Chad was SO excited when he opened the package that contained his Lions t-shirt! And then he was even more excited when we got to Buffalo Wild Wings and realized there were several tables full of people ALSO cheering for the Lions! It really made my heart smile to see him so happy :) And best of all? His beloved Lions won the game, and are 5-0 on the season! A great day for the Weatherman, and for the Lions. As you know, last week was a major high for me – I won my first ever Fantasy Football game AND had the most overall points in the entire league. This week, while still managing to score an impressive 134 points, I lost. Sad face. If you know me, you know I HATE to lose! I did make a miraculous comeback in the Sunday night game – I was down by 52 prior to its beginning and lost by 23 in the end. Not bad. Too bad the other guy also had a key player on Sunday night – otherwise, I could have mounted the most amazing come-from-behind-victory in Fantasy Football history. As I’m sure you’re aware, we just wrapped up Week 1 of the 2011 NFL season. You’re probably also aware that this is my first year to play Fantasy Football, and I’m in a league with a bunch of guys with whom Chad works. That’s me – Victorious Secret! I’d like to give a special shout-out to Wes Welker – thanks for that 99-yard TD run, LeSean McCoy – I didn’t watch your game, but thanks for scoring lots of points, and Matt Forte – I didn’t watch your game either, but *game tap*. I realize that I will probably never win a week again, and I’m totally okay with that. I will revel in this all season! YAY!!! In the spirit of full disclosure, Chad helped me pick my team, and therefore is partially responsible for this and any other wins I may get during the season. But he didn’t do it all – I did stuff too! As you know, we spent time apart. And I didn’t really care for that (even though I did have fun). 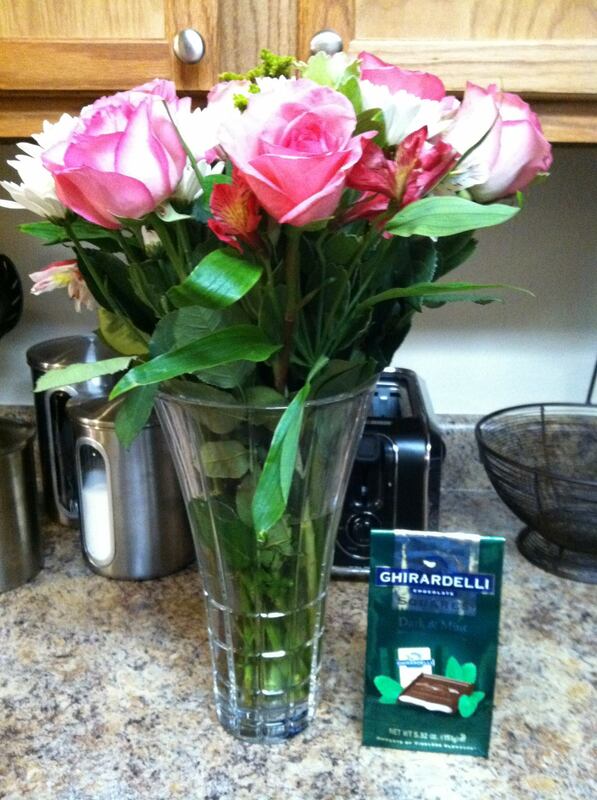 That’s right, pink roses – my favorite – and dark chocolate/mint chocolates from my hubby. How awesome is that?! Just shows how much he knows, loves, respects and cares for me :) But that wasn’t all – he’d also spent three hours making me a homemade dinner – chicken breasts with Salt Lick BBQ sauce and steamed potatoes and veggies. And it was waiting on a candlelit table. With jazz music playing in the background. DYING. So romantic! Have you hugged your husband/man friend yet today? You should. They deserve it!